A man paralyzed by a rare condition stood for the first time since his diagnosis to propose to the mother of his children. 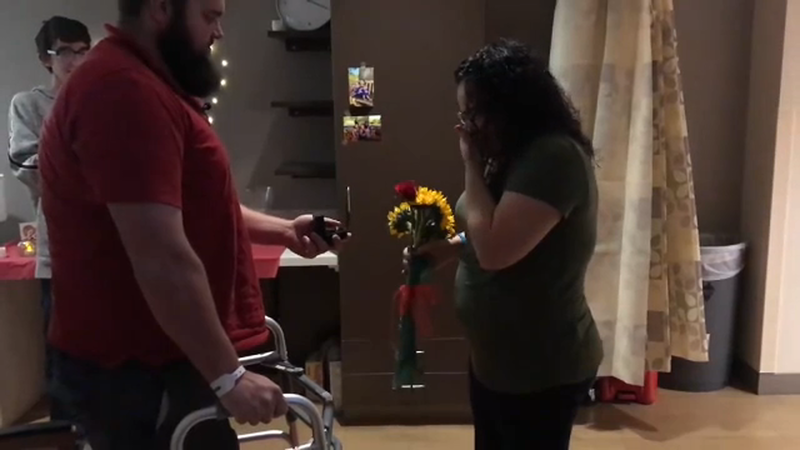 JACKSONVILLE, Florida (WPVI) -- A man paralyzed by a rare condition stood for the first time to propose to the mother of his children. Jacob Newbern popped the question to Mary Batar on Monday -- one day before he returns home as he recovers from paralysis. Last month, he was diagnosed with a rare neurological disorder in which his body's immune system mistakenly attacks part of its nervous system. His doctors told "Good Morning America" that he is doing phenomenal and progressing way more than expected. Newbern now hopes to spread awareness and help others recognize early symptoms. The couple has three children together, including 10-month-old twin girls and a 3-year-old daughter.